More inspiration from Last-Minute Patchwork + Quilted Gifts: I made these two embroidered/pieced pillows as gifts for the kids of some of my wonderful mama friends. These are unbelievably cute and I plan on making more. 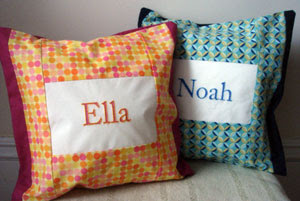 As with the big girl quilt I posted about previously, I used Electric Quilt Printables InkJet Fabric Sheets to create the personalized fabric and eco-friendly pillow forms (made of PLA, a corn-based fiber), both available from Jo-Ann.com. I altered the pattern to fit square instead of rectangle pillows.